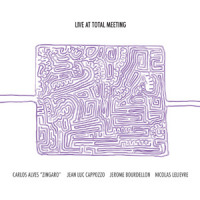 The cover to Live At Total Meeting depicts a maze, and that's a good metaphor for free improvised music. No-one knows where they are going or how they will get there. Even whether they have arrived or not is open to dispute. How the participants achieve resolution (of a sort)negotiated, as it often is, without verbalizationis part of the enduring fascination of such sessions. For sure, the risks are less when veteran improvisers like the Portuguese violinist Carlos Alves "Zingaro" and French trumpeter Jean Luc Cappozzo are onboard, alongside fellow Frenchmen reedman Jerome Bourdellon and drummer Nicolas Lelievre. Between them, they have performed with all the major European and American innovators. That experience ensures a successful outcome on these three collectively navigated pieces recorded in Paris in late 2010. There are no longueurs, and no-one hogs the limelight, as the foursome understatedly but purposefully moves through the range of combinations inherent in the lineup. Each player maintains interest by endless variations in timbre, dynamics, and attack, while also exploring the tension between consonance and dissonance. Zingaro displays a nervy energy, alternating eerie creaks with taut glissandos, while Cappozzo pits vocalized inflections against pure tones and puttering exclamations. Bourdellon's breathy fluttering and multiphonics on flutes are in contrast to his agile scampering between registers on bass clarinet. But it is Lelievrethe youngest of the four by a generationwho exerts the biggest influence, largely through his choice of whether to add a pulse to the proceedings or not. Some of the finest moments come when the group settles into repeating patterns to create a substructure to underpin their endeavors, as towards the conclusion of "Total 2," where Lelievre contributes momentum to a passage of extemporized intersecting lines. Similarly on "Total 3," Bourdellon initiates a bass clarinet ostinato, supplemented by percussive clatter, over which Zingaro's singing violin and Cappozzo's heraldic trumpet fanfares intertwine. Such interludes illuminate the more indeterminate give and take which precedes them and lend a sense of narrative by providing the ultimate destination. Track Listing: Total 1; Total 2; Total 3. Personnel: Carlos Alves "Zingaro": violin; Jean Luc Cappozzo: trumpet, bugle; Jerome Bourdellon: flutes, bass clarinet; Nicolas Lelievre: percussion.